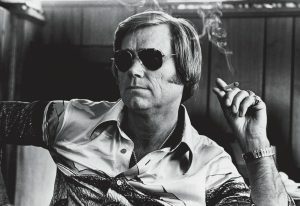 I was sitting at the bar in Tootsies Orchid Lounge in Nashville on the day of George Jones’ funeral. I was the guy sobbing and gripping on to a PBR for dear life. I’m not even a country nut; I’m a retro punker who fell in love with gut-wrenching honest music – the kind of stuff Johnny Cash sang about: Love, God, and Murder. Journalist Terry Mattingly pointed me in the direction of an essay by Rod Dreher about Sad Songs and the South. He was riffing off of Malcolm Gladwell’s podcast King of Tears about songwriter Bobby Braddock. Gladwell’s podcast is fascinating as it differentiates between country and rock music. I am eagerly wanting Gladwell to do a follow up on the connection between the southern blues and the West Virginian coal miners — they never had 4O1K’s, but they had audacious truth, they had dirt under the fingernails, they had a rag-tag community link that cared for widows and snot-nosed kids. They did wrong — but they knew it. They did not try to psychologize it away. They knew they were guilty – and in need of redemption. In the South, the juke joints are packed and sweaty on Saturday night, but the altars are packed in the clapboard churches on Sunday morning — a realistic rhythm of life, sin and redemption all in one motion. I like old country. The fearless honesty of country songs is the kind of self-revelation that gets a respectable man or woman fired from a job, but it is the kind of song that those same people listen to on a transistor radio while they are working in the garage or preparing supper. Theologically, it is also the kind of Southern Protestant version of the confessional. There is no veil between the priest and the sinner. There is only a microphone and a heart laid bare. Bloody authenticity, the smoking gun, the shameful guilt, the fingerprinting at the jail — all out there for the world to see.